The image of a Muslim woman wearing an American flag as a head covering, or hijab, is not a new one. Since 2001, it has become an increasingly common form of political speech. 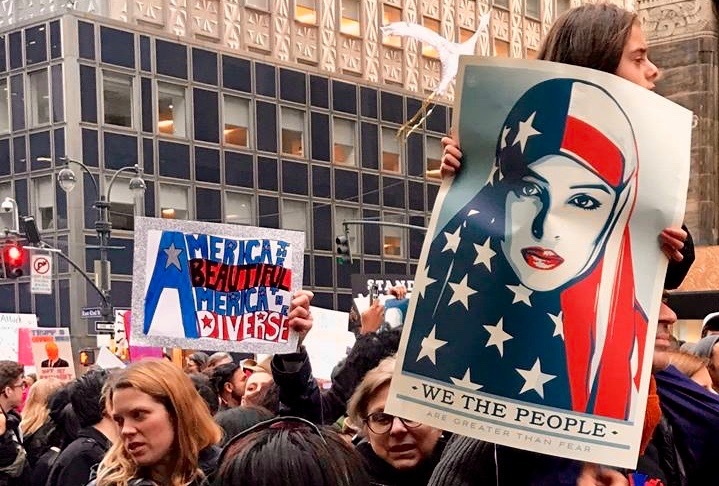 This week, however, it has grown downright inescapable--thanks in large part to the "We the People" poster campaign that includes Shepard Fairey's adaptation of Ridwan Adhami's iconic photograph of a Muslim American woman swathed in the Stars and Stripes. While I understand the temptation toward this imagery (Look, we're American too! ), I am now officially sick and tired of it. So I ask, with all due respect, can we please retire the American flag hijab already? Certainly, Muslim American women are no less American than our non-Muslim counterparts. But other Americans need not literally drape their heads in the flag to prove their Americanness. Furthermore, the female head coverings known simply as hijab to so many are in fact cultural constructs that predate Islam. They are not inherently Islamic by any stretch, and pretending that these veils are somehow Islamic inventions misrepresents Islamic history and even what it means to be a Muslim woman today. Images of presumably patriotic Muslim American women turning flags into headscarves imply that we are easily identifiable by a piece of fabric, which we are not! Like most of the Muslim American women I know, I do not wear hijab, and among my Muslim friends and family who do cover, I have never seen any of them sport an American flag hijab. Despite what ISIS and the new American president may claim (and note, it's the same claim), Islam is not about creating or enforcing worldly borders; it's about surpassing them. Islam claims no exclusive nation or ethnicity. Muslims represent the second-largest and fastest-growing religion in the world, with roughly 1.6 billion adherents as of 2010 according to the Pew Research Center. In short, we are diverse, and it's about time we start respecting and representing that diversity, especially among Muslim women and gender non-conforming individuals who may or may not choose to wear hijab in any of its many incarnations. It's time to diversify the narrative and retire this caricature of the patriotic Muslim American woman once and for all. It may have been a powerful statement at one point in American history, but today, it has turned into a symbol of misrepresentative tokenism. As a Muslim woman, I demand to be seen as more than a prop or a mascot. I am a human being, just as deserving of basic human dignity and respect as anyone else--whether I cover or not, whether I wave the American flag or burn it, whether I'm kneeling on the ground as I pray inside of a mosque or washing down a BLT with a glass of whiskey as I play craps inside of a casino. A strip of fabric is not an abbreviation for a human being, and it fails to capture the complexity and variety of our experiences as Muslim women. I deeply respect my hijabi sisters, which is why I refuse to politicize their bodies. The politicization and otherization of Muslim femininity--a tactic used by extremists and liberals alike--belittles and stereotypes us as Muslim women, and it needs to stop.